We're actually going to get an animated Guardians show on Disney XD this year, but had the characters been in the very gifted hands of Hanna-Barbera decades ago, this is totally what it would have looked like. 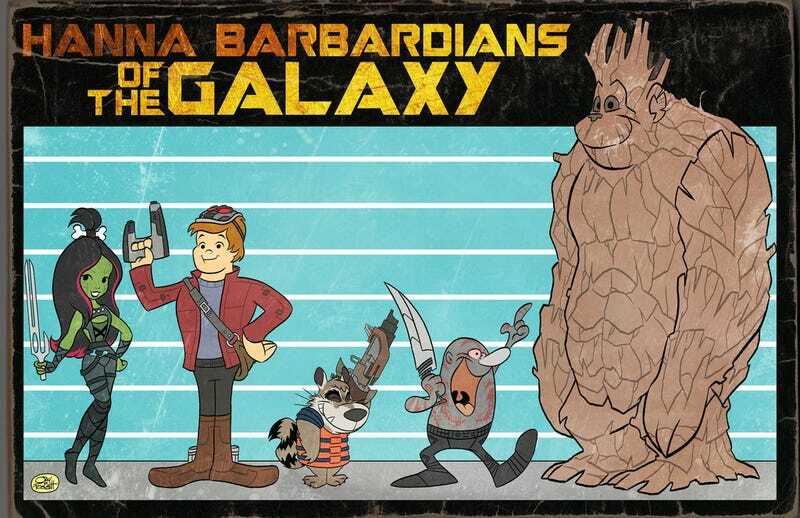 The Guardians of the Galaxy, envisioned as a 1970's Hanna Barbera cartoon. That's teenage Pebbles and Bamm Bamm as Gamora and Star Lord, Muttley as Rocket, Captain Caveman as Drax, and Grape Ape as Groot. I added a distressed texture to give this piece a vintage "garage sale" look. Excuse me, I'm going to go watch Guardians and every old cartoon I can find.